It seems like Nickelodeon shows are more popular than ever now, and all the new toys, dumb video games, and silly records sung by their most popular characters seem to be helping. 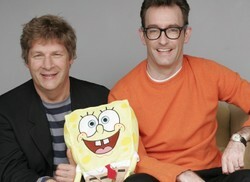 And now, Nick Records has released "SpongeBob SquarePants: The Best Day Ever." This is a very silly but very funny album sung by the animated characters of the SpongeBob show. It has songs that relate perfectly to the characters’ personalities like You Will Obey!, sung by the controlling Plankton, Fishin’ For Money, by the penny pinching Mr.Krabs; Who Wants To Race Me?, by Sandy the very, very athletic squirrel; and Under My Rock by the loveable homebody Patrick Star. This album doesn’t sound like you’re listening to an album – it’s more like you’re listening to Bikini Bottom’s very own radio station, WH2O. The show is The Al Bacore Show, hosted by “Al Bacore, the Tuneful Tuna.” Coincidentally, the voice of Al is done by veteran Philly disc jockey Jerry Blavat who still hosts an oldies radio show on WXPN. Requests from Squidward, phone calls to Patrick, and ticket giveaways make you feel like you have tuned your dial to WH2O. The album has a lot of typical SpongeBob humor, like the absurd track names. Its humor appeals to ages young and old. I thought the best thing about it was the energy of the acting. The actors sound like real musicians, especially Doug Lawrence (who, in addition to being the voice of Plankton, is a real musician!). And the actual musicians who back up the characters’ songs are pretty good. They even got Tommy Ramone on drums, James Burton on guitar, and of course, Stephen Hillenburg (the creator of the SpongeBob show) on guitar. Background voices include the Beach Boys’ Brian Wilson. The songs were written by famed songwriter and record producer Andy Paley (a background singer, and credited for numerous instruments) and Tom Kenny (the voice of SpongeBob and Gary the snail). The lyrics sound very much like the lines of dialog you would hear in the show, such as Patrick’s, “It’s where you’ll always find me, if you’re walking right behind me!” from Under My Rock, and “I got here faster than a greased pig with a rocket in high gear tied to his tail going down an icy rollercoaster track trying to get home in time for supper to his mama!” from the jittery Sandy in Who Wants To Race Me?. This music CD also includes a music video of the title song as well as the “SpongeBob SquarePants: Creature from the Krusty Krab” game. In short, this is an amazing album with silly stuff, playful puns, great vocals, and a great cast of musicians. This is an album for all ages, especially anyone with a sense of humor. Although it’s geared for kids, even my mom had fun rocking out to it.